I'm currently on cloud nine over the SF Giants right now. In fact, am so distracted with the World Series that I have put off a lot of things on my "to do" list on hold. I know some of you may not be into baseball like I am, but thanks for indulging with me while I take a moment to ramble! When I wasn't wearing my Giants gear, I wore this simple layered outfit. The air is getting colder and colder in SF and all I want to do is wear sweaters and knit hats. I decided to keep this look entirely simple with muted colors and subtle pattern mixing (my stripe top and leopard heels). 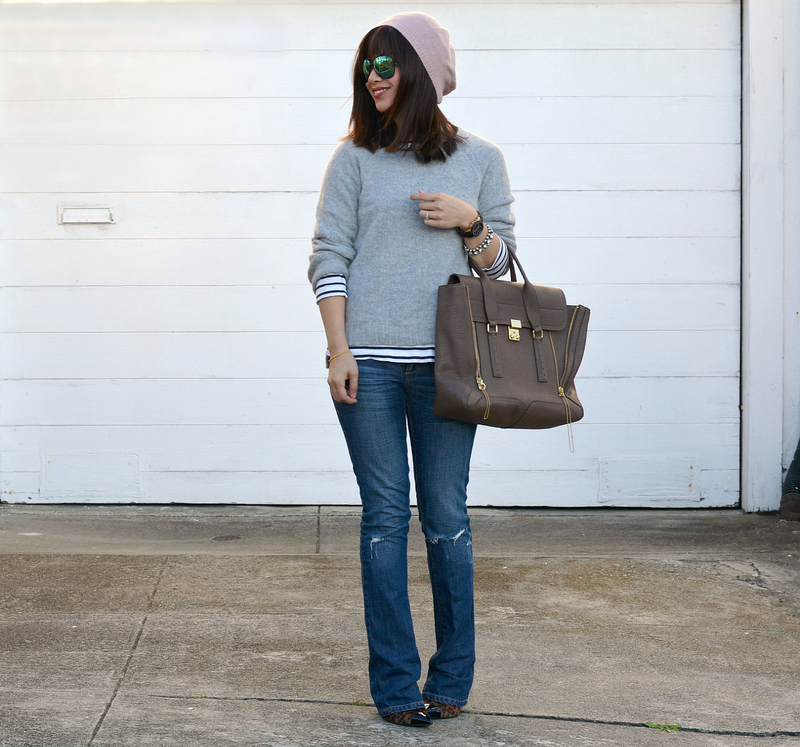 I love the pairing of light grey with soft pink and this look is one of my favorites. Wearing these mirrored sunnies (you last read about here) gave the look the extra "edge" I wanted. I love the stripped sweater under the muted tones...great look! Congrats on the your SF team! Yesss, Giants!!! I cannot believe last nights game. Incredible! 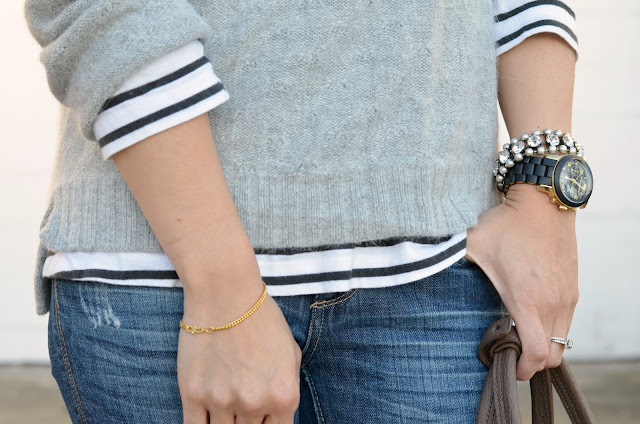 Love the gray sweater over stripes, very comfy but so cute! love the outfit! perfect for fall! Go GIANTS!! And love this cozy outfit! this look is so cute on you. fall casual chic is the right way to take on the pending november gloom!!!! and yes those sunnies add a perfect little pop to your outfit!!!! I love the strip tee under the sweater. I have similar pieces, so I'm definitely going to do this! I love stripes! And I love your style :) So naturally, i love this outfit! It's so casual and chic. Definitely something I can see myself wearing on a day-to-day basis! As always, thank you for being so lovely! 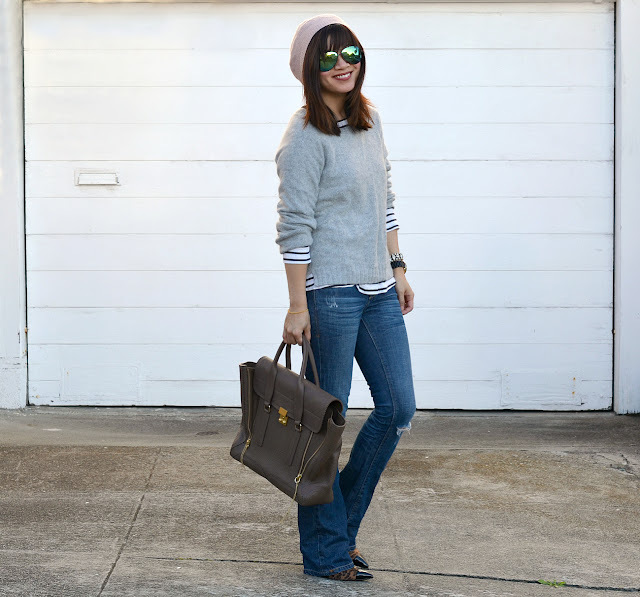 Digging these layers, and LOVE those mirrored shades! I love the little bit of stripes peeking through. Such a cute outfit! Yeah! You are so cute! Thanks for leaving me a comment on my blog! I would love to follow each other! 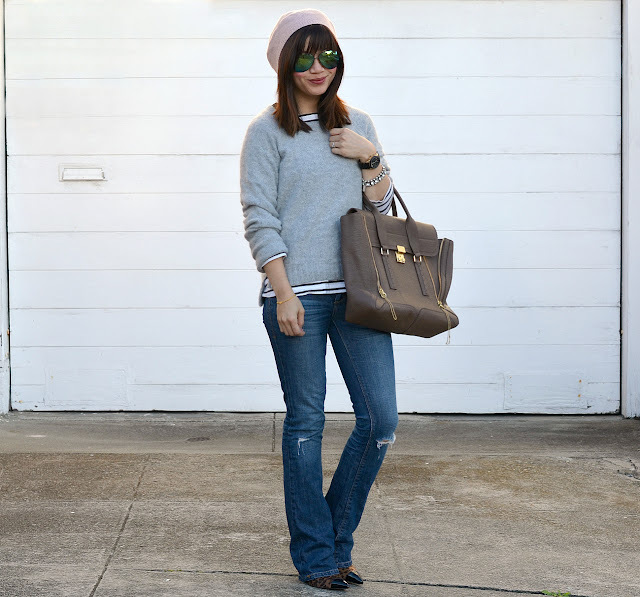 I love your blog, and this look is very fun and laid back... defiantly something I would like to wear! :) I now follow you on GFC, please return the follow! You're beautiful! That look is one of my favorite too. It's comfy and edgy! Congrats on your SF team. Love this layered look, so cozy and easy going. Totally want to replicate! Thank you for the sweet comment and love your shades!! Would you like to follow each other on gfc and bloglovin? LOVE, LOVE this look! 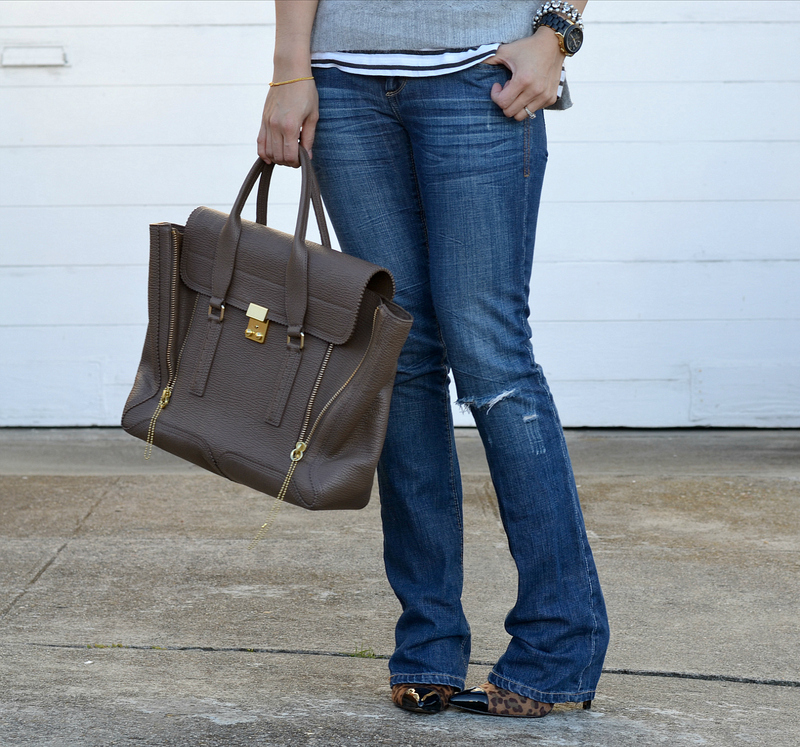 It's casual yet so chic! I LOVE the stripes popping out of the bottom of your sweater! I love the peek of stripes underneath. And I am on cloud 9 too!! GOOOO Giants!! love the outfit!!!!! the sweater is so pretty! xO! Thanks for stopping by my blog, I'm so glad I discovered yours I am your newest follower! I love finding bloggers from the Bay Area because I'm from San Jose, haha. wow, you glasses are amazing! i love your outfit and the combiantion with the glasses is incredible. they are very eyecatchy and give the whole outfit a special touch! you are very professional and your styles are very elegenat and styl you stay unique. you are a natrual beauty and i love your healthy and beautiful brown hair! This hat is the perfect touch to your outfit. What a cutie you are!! Hi!! I love your outfit but your basic shirt is perfect with this sewater! Kisses! Oooh, I LOVE this! Very fashionable and functional at the same time. Super cute. one of my fav outfits of yours! so great.